Jennifer here with some thoughts on waiting. I have to start this post with the past. Two years ago I had an aunt give me a gift for our second baby. In the course of writing thank you cards I somehow missed her. So I made a mental note to go back later and write the note. I never did….and my Aunt passed away suddenly from a heart attack. Now every time I look at her gift I feel awful that I never sent the card. I had it on my heart to write a card to a friend and her mom because the mom had been sick, I never took the time to do it. Yesterday, her mom passed away. As heartbroken as I am over her passing, I have a lingering guilt because I had kept meaning to send her a card and now I can’t. I am so saddened that I didn’t make the time to send those cards. As I thought about how I missed my chance, this verse came to mind. We are a mist, our lives are a vapor. Let’s not let it pass by without enjoying everyone in our lives and reaching out to them when they cross our minds. In the world we live in it is pretty easy to get in touch with someone. We can text, email, fb message, and there is the old fashioned phone call (yes I know, that does exist still!) And probably the most touching a handwritten note. I hope you will join me in reaching out to friends and family, show them that we care, and that we are thinking of them. It really doesn’t take much time, let’s remember that time is a gift and not take advantage of it. Let’s make the most of our time today, for we know not what tomorrow will bring. Stay tuned for a post about how I have organized my cards and addresses to make sending notes easier. Hi everyone Jennifer here with a laugh about my very Mom morning! Yesterday morning started around 6:15, not by my choice but my toddlers. Hahaha, it was a thought right….And it’s the thought that counts? Responded to some messages on Facebook….y’all I found my LuLaRoe unicorn while fooling around on my phone at 4am and she still had it!!! Changed and dressed the toddler. Tried to get dressed too realize a few things: it was raining which meant I couldn’t wear my brown cowboy boots, because I never got the bottoms fixed and they have a hole in them so my feet get wet. I couldn’t wear a dress and flip flops because my black leggings were dirty (mental note made to order another pair). So settled on my black boots and was happy to know I don’t wear them once I get into co-op. 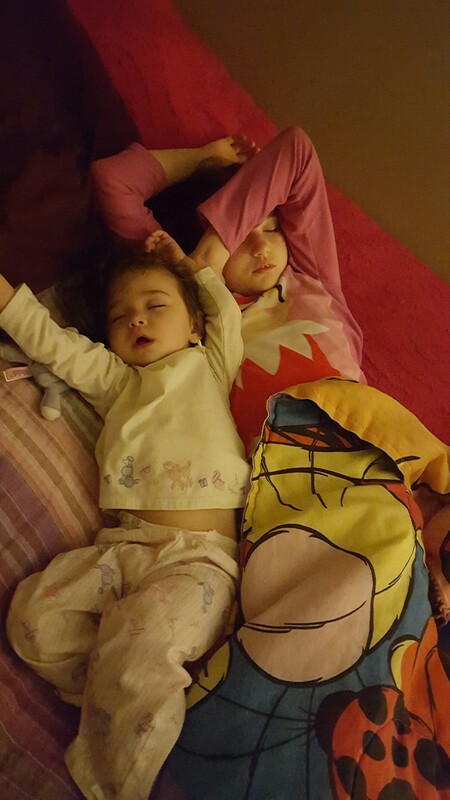 Stood with my husband and laughed while our toddler climbed on our oldest to wake her up. Put a load of diapers in the wash. Went into the kitchen to pack for co-op followed by a toddler who suddenly became starvin marvin. So I reluctantly gave the starving toddler a cup of rice krispies which she almost immediately dumped in the floor…seriously why do they do that? Started packing snacks while laughing to myself because it never fails that we get to co-op and said toddler doesn’t want what I packed, but what all the other kids have. Then once again was thankful for the group of women at this co-op and their kindness. Go to brush my teeth where my toddler joins me and wants to brush hers. Which was adorable until she climbed on the toilet and tried to eat the toilet paper. Go back and double check diaper bag and add diapers and wipes. Go crank the van, then come back and console my toddler who I guess thought I left her forever. Hear the baby start to fuss so make a bottle, put her in her car seat, and ask my oldest to give her the bottle. Got the kids and all our stuff out the door and in the van…even remembering to grab the overdue library movie! Yay me! Start driving and thinking that I have no idea how these mom’s do it that have to work outside the home or have more kids than me….Then realize there is a wasp in the van!! Pull over in the neighbor’s driveway and get out. (Scold the dogs not to jump on me since they followed me) Start wondering what I will do. So I decided that if I had a long stick I could reach from the passenger side to the driver’s size and encourage it out. So I found a stick then went to open the passenger door only to find it locked (one day I will remember this van does that) so walked back around to the driver’s side and unlock the doors. Go back to the other side take the stick and nudge it out the door. Then laugh as I think what my neighbor would have thought if she saw all this! Get back in the van to have my oldest ask me if I got the babies bottle…..no, no I didn’t. So I turn around, tell my oldest that she did a good job catching that, and go get the bottle. Get back on the road and realize that we will still be having McDonald’s breakfast, there is no time to run and get our donations, I didn’t straighten anything and we have a friend coming for lunch, and we would be late to co-op. Then I called my mom and relayed my morning and had a good laugh. Truth is I am a mom. The hours are long, somedays are hard, sleep is interrupted, there is a constant worry about so many things, showers are surprisingly difficult…..but it is the greatest blessing. I love being a mom more than I ever knew was possible and wouldn’t trade the crazy days for anything! I hope you got a laugh out of my very mom morning and can laugh through your next one and remember these are the days we will miss. This has encouraged me to get back on my study of Proverbs 31 and living intentionally. So hopefully I will get back to sharing those thoughts with you soon. I love this book. 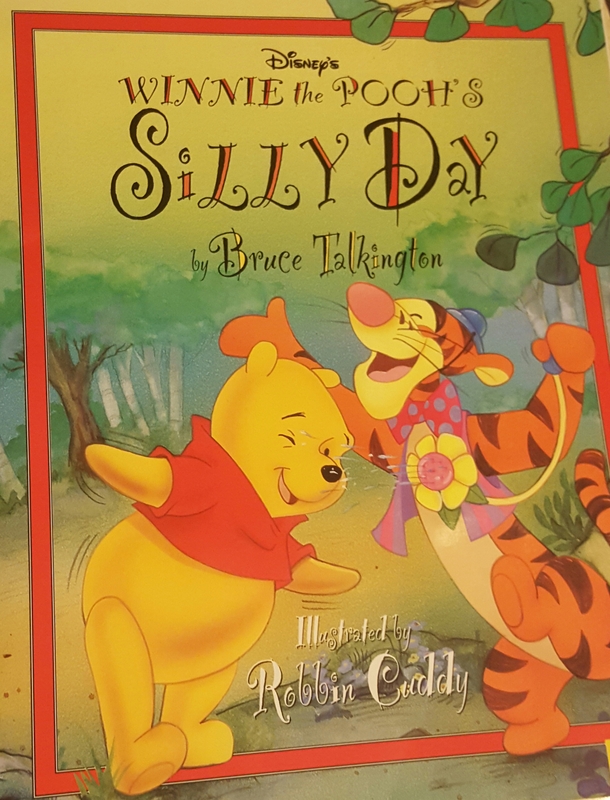 It is the fun story of how Pooh and his friends are going to catch the “April Fool” and fool him, before he can fool them. This book is sure to be a favorite of yours and to give you some laughs with your little one as you read it. Now, of course April Fool’s Day is coming up! So it’s the perfect time to share this book with your little(s) and then play some pranks on them! Check out my April Fool’s Day Board on Pinterest for some great ideas and a coloring sheet. And because I have always wondered how this day came to be I just had to consult Google! I found a great article on History.com that you can enjoy and share with your kiddos. I hope you enjoy this book and your day of pranking!! 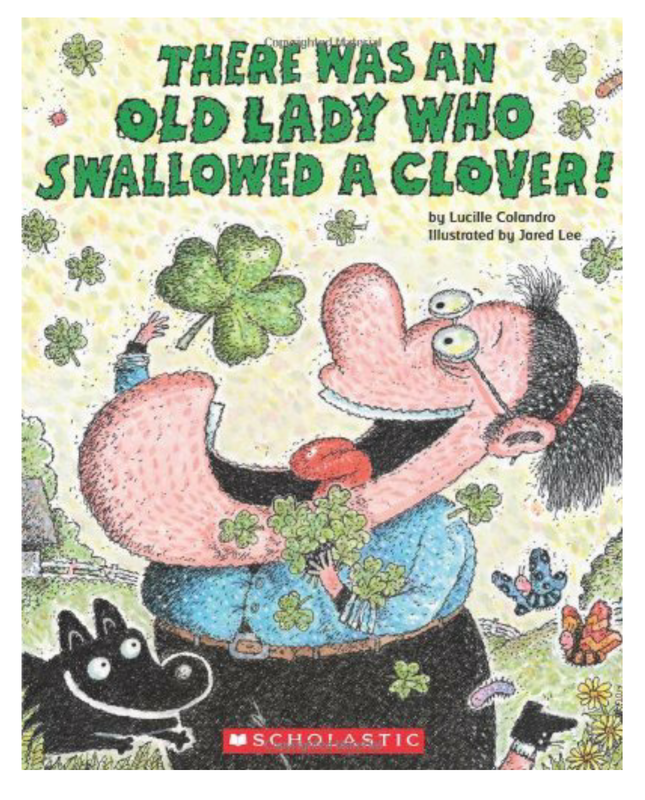 Today’s book is one I recently came across when I was looking for St. Patrick’s Day goodies for the kids. This is a fun book that entertained my 8yr old greatly. You follow along as the Old Lady swallows various things for various reasons until the end when it all comes together and you see why she swallowed what she swallowed. I highly recommend this as a fun St. Patrick’s day read! I purchased ours on Amazon for less than $10, but you could also check your local library! Now for some St. Pattys Day fun!! Check out this link to my Pinterest board for ideas that go along with this fun book! We always enjoy crafts, leprechaun traps, and green pancakes! Check out this link for my St Patty’s Day board! I hope you have fun celebrating this holiday with your littles! There are several books in this series. We also have There Was an Old Lady Who Swallowed a Bell which is for Christmas. Be sure to check them all out! Hey everyone, I know it’s been a while! I started this post months ago, but life happens and I never finished it. It has weighed on me though and I wanted to share this with you. We have all been in this situation: you have a fellowship meal or ladies brunch and something happened and you didn’t cook anything. It may have snuck up on you (life gets busy), you may have not been feeling well in the days leading up to the event, you may just be exhausted from work/school/the kids, or you may have not heard about the event until the last minute….but whatever the reason the time is here and you have nothing. You could go buy something, but your budget is tight and we all know how much a bakery charges for goodies….but you can’t go empty handed. I’m here to tell you, you can go empty handed! We were going to be having a brunch to discuss ladies day. I wasn’t sure we would make it because we were leaving that day for vacation. One of the sweet women simply said “come if you can come, don’t worry about bringing anything, I know you have a lot going on.” Well, you know people always say things like that, and we are all busy. True, our homeschooling year had started back up, I have a very active toddler, and I was pregnant with #3 at the time…then throw in regular household chores and packing 4 people for a week…I was a little frazzled…But, I was raised that you don’t go empty handed to a meal. What would people say? What if everyone did that? There wouldn’t be any food! So I had it in my head I would get something made. Well, the day came and we decided to leave later in the afternoon so I could go to the brunch. I didn’t have anything to take. I thought about what the sweet lady said “just come”, and I remembered the countless times I have heard it said “don’t worry if you didn’t bring anything, just stay/come and fellowship”. So I went empty handed….well in a manner I had 2 little girls with me. You know what? No-one said anything, there was plenty of food, and I got to spend the morning with my sister’s in Christ and my daughters. Ladies, it is okay if every now and then you come to a meal empty handed. Mommas, the older ladies understand. They have been there! They know what it’s like to take care of a family, they know how hard it is to squeeze in another chore, they understand! It’s okay, it really is. I’m not saying that all of us should go to every meal and not bring anything, but I am saying it is okay to do it when necessary. Go, fellowship, let others help you. It is okay, it really is….being together is more important than pecan pie. Hey all, it’s Jennifer with a very honest post. Today was the day that homeschoolers could get into the pumpkin festival for cheaper. I had been looking forward to it for weeks and so had my daughter. Well, our weeks lately have been so busy and this week we had gone out everyday, I just wanted to stay home today. We are a day behind in school, I had laundry to do, I have blankets to make, I have 31 totals to figure, I have a vendor event to prepare for….I kept thinking, I could just take her another day….but I knew the days ahead are no less busy and it wouldn’t happen. So I packed a lunch, packed the baby, wore comfy shoes, and took her to the pumpkin park. The whole way I was thinking about a way to get out of it, then when I pulled up and saw the 50 school buses I really didn’t want to go in. (It wasn’t really 50, I am exaggerating). Her squeals of excitement from the backseat were enough to make me feel really guilty. She was so happy! I felt awful for feeling the way I did. She goes with me everywhere, and doesn’t complain that much (She is a kid, there is some complaining). Just yesterday I dragged her to Wal-Mart, Staples, and Dollar Tree. It was very selfish of me to not want to take her out today. It wasn’t her fault we had been out everyday this week. I think we all go through this as parents. We just don’t want to do something, and it’s easy as the adult to excuse our way out of it. I have done it in the past. (I am not saying we have to do everything.) But it is easy to put what we want to do on the priority list and put what they want to do on the back burner. There is so much going on in life between home, church, school, sports…it’s hard to want to add in anything else. And I think it is completely understandable, but we have to remember that those little extra things mean the world to our children. Those little extra things can turn into great memories. So we went to the pumpkin park and we were there for 4 hours. I am sunburnt, and my feet hurt (did I mention I’m pregnant? ), and I am exhausted. But my little sunshine had an absolutely fantastic time! She saw Batman, Capt America, Batgirl, and Ariel. She got an ice cream cone. She petted animals. She got her face painted. She saw huge pumpkins. She got to see friends from co-op. She rode a zip line. She had an amazing time. She smiled and laughed and played. She told everyone at the store later about all the fun she had. The whole day and on the ride home she kept thanking me for taking her to the pumpkin festival. When we got home she put aloe on my face because she is the sweetest kid in the world and wanted to help me feel better. My sunburn will fade. My feet will continue to hurt because I’m pregnant (and I don’t like shoes), it really doesn’t matter that we are behind a day in school, the laundry was easily moved from the bed for us to sleep, and I still have tomorrow to prepare for the vendor event. What’s truly important is the smile on her face and the time we got to spend together making memories that will hopefully last a lifetime. So my encouragement to you is: let the other things go undone every now and again and just enjoy taking your little one somewhere. Just enjoy them, because as we all know this little thing called childhood goes by way to fast…and don’t feel bad that your not super excited about it, just stay positive and it will all work out! Hi y’all! Jennifer here with my first study into Being Intentional: A Proverbs 31 Study. I have to be honest, I picked this to start with because I am struggling in this department pretty badly right now. I just can’t seem to get it together lately….I do not feel like I eat the Bread of idleness (well a little) but not enough to account for where I am at in regards to looking after my household. My oldest was excited because she was supposed to start on a jr. bowling league, and we were supposed to be there at 9. I woke up late because I never set an alarm, I rely on my husband and the baby. Well, my husband was in the woods for opening day and the baby actually decided to sleep past 7 that morning. I get up, get my oldest up, get us dressed and fed (I am trying to do better about eating out, that will come in a later post), then remember the diaper bag hasn’t been restocked and the stroller is not in the car. So I send my oldest to take the stroller outside while I pack the diaper bag (grabbing an outfit because the baby is still wearing the outfit she ate in) and put the baby in her car seat. My oldest comes inside and says “I’m sorry mommy, the stroller is in the creek”…….what?!?!?! I don’t know exactly how, but she lost control and the stroller is in the creek. I don’t handle this news well, we are late and not ready to go. I have a mini meltdown during which my big toe gets caught in my skirt hem and twist sideways….it hurts like crazy, but I don’t have time to worry about that, I still have to get loaded in the car and get the stroller. (Which luckily was just over the bank, not actually in the creek) by the time we are in the car and going we are super late. As I apologize to my oldest, and pray my toe isn’t broken I realize that there is no way we are making it to this bowling thing in a timely manner. So I calmly explain to my daughter that we are to late, and I really don’t think that at this point we can handle this activity (we have other things already scheduled on a lot of Saturday’s). She takes it well because she is amazing, she is crying and sad but understands. So I turn around and we head back home, me feeling terrible because this horrible morning is really my fault and the fact my child is crying is my fault.I could’ve been better prepared. I get home and call the bowling alley only to find out we didn’t have to be there until 9:30 😦 but they have a second half of the season which starts next year so maybe we can do that. I failed miserably at looking after the ways of my household that morning, and if I’m completely honest I am failing at that pretty regularly lately. I can make excuses, and they would be legitimate…..but still I am not doing what I should to look after my household. Being a homemaker is something I wanted to be for years, I love saying I am a homemaker. However, I am not providing the home that I want for my husband, my children, myself, or company. I am far from the home I want and the feeling of home I want my children to remember. I decided that morning that I would do better….but I haven’t improved much. Today I realized: I need a plan, I need to be organized, I need to ask for help, I need to pray, I need to take steps (no matter how small) to improve this. Recently in a bible study group we were discussing worry and I commented that I don’t worry, but I get overwhelmed. Things build and build until I just can’t take it anymore. A sweet friend said that she has found journaling helpful as she gets overwhelmed. So tomorrow that is my goal, I will take a binder and using dividers I will make sections for different aspects of my life. I will add paper and then start making notes for each thing in my life that I have to take care of. 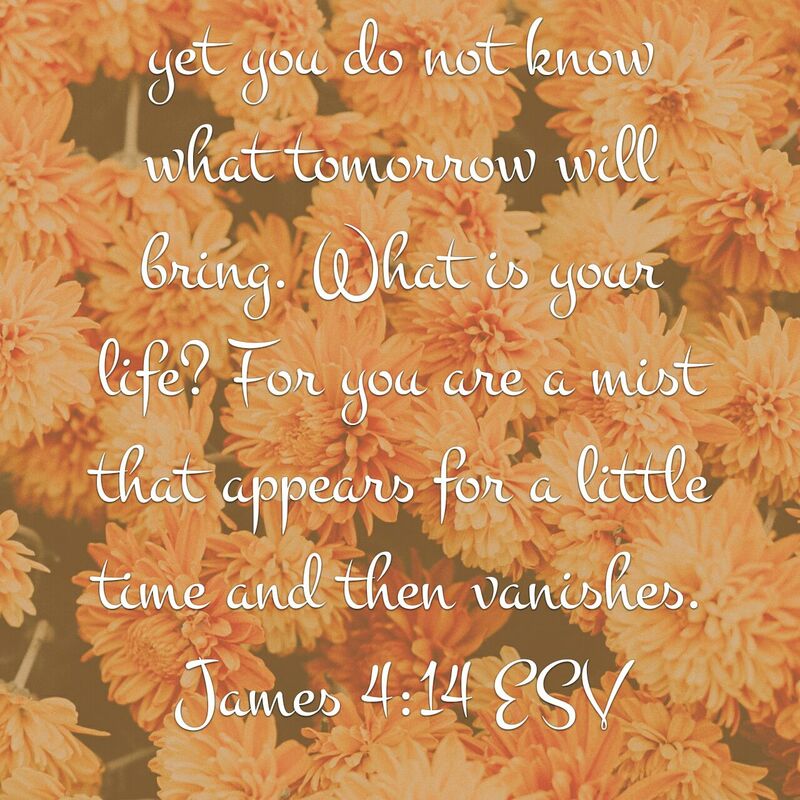 I am going to also look at different cleaning routines and add that to the book, and I think I will make a cute cover with today’s verse on it to help keep me motivated and on task. I will share with you later how that goes. I have to admit, just having a plan makes me feel better! Do you have any tips on being organized? I will post again in a few days to let you know how I am progressing and what I have found that works!